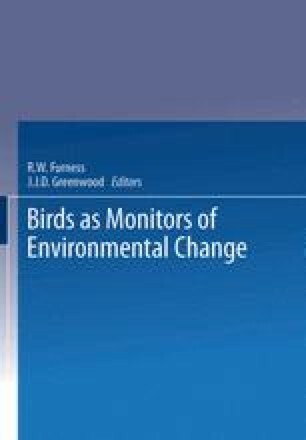 Several authors of books on the monitoring of pollution have advocated the use of animals as monitors in terrestrial and aquatic environments (e.g. Phillips, 1980; Schubert, 1985). Such studies tend to emphasize the use of sedentary invertebrate animals as biomonitors. By comparison, birds suffer from several apparent drawbacks. They are mobile, so pollutants will be picked up from a wide, often ill-defined, area; they are long-lived, so pollutant burdens may be integrated in some complex way over time; and they have more complex physiology, and so may regulate pollutant levels better then invertebrates. Furthermore, birds tend to be more difficult to sample, and killing birds may be unacceptable for conservation or ethical reasons. However, some of these characteristics may at times be positively advantegeous. Integrating pollutant levels over greater areas or timescales or over food webs, may be useful, provided that species are chosen carefully. Less sampling may be necessary if birds can reflect pollutant levels in the whole ecosystem or over a broad area. In addition, since they are high in food chains, birds may reflect pollutant hazards to humans better than do most invertebrates. It is also significant that birds are extremely popular animals with the general public, so pollutant hazards to them are likely to receive greater attention than threats to invertebrates.